Namtok Ron Khlong Thom located quite near to the Emerald pool, is in a shady forest area with numerous hot springs. The hot springs and cool streams converge on a slope to form lovely cascades of warm water with a temperature of 40-50 degrees Celsius. The best time to visit is from 7.00 a.m. to 8.00 a.m. and from 4.00 p.m. to 5.00 p.m.
To reach the waterfall visitors should travel 45 kilometers from town to Amphoe Khlong Thom, then take Sukhaphiban 2 Road for another 12 kilometers. The admission fee is 10 baht per person. 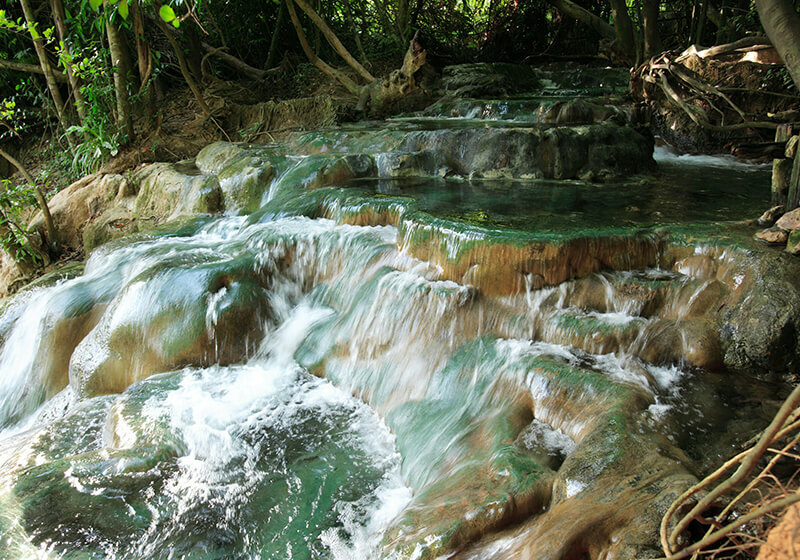 Short Description: The hot springs and cool streams converge on a slope to form lovely cascades of warm water with a temperature of 40-50 degrees Celsius. The best time to visit is from 7.00 a.m. to 8.00 a.m. and from 4.00 p.m. to 5.00 p.m. To reach the waterfall visitors should travel 45 kilometers from town to Amphoe Khlong Thom, then take Sukhaphiban 2 Road for another 12 kilometers. The admission fee is 10 baht per person.